A £30m plan to take pressure off a troubled NHS trust's A&E has been unveiled as a new boss takes over. Brighton and Sussex University Hospitals (BSUH) is in special measures and will be led by Western Sussex Hospitals (WSH) for three years. 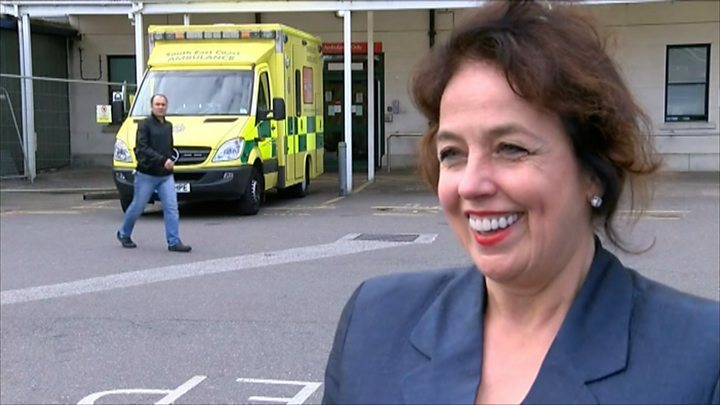 Marianne Griffiths, who will be chief of both trusts from 1 April, said BSUH was constrained by its current A&E. She said £30m government cash would pay for an emergency area next to A&E to provide extra capacity and space. Last year inspectors said Brighton's hospital trust was unsafe and poorly led. The Care Quality Commission criticised both the trust's board and Brighton's ageing Royal Sussex County Hospital site. Issues included cancelled appointments and operations, delays in providing diagnostic results, low staffing levels, overcrowding and concerns over fire exits. Ms Griffiths said: "The primary objective of the organisation coming in is to make sure we exit those special measures as quickly as possible because it really matters to our public, to our patients and our staff." She said one of the most important developments was the new emergency floor. Under the plans, the new emergency floor would sit next to A&E and patients could be sent there after first attending A&E, or they could be referred directly by their GP. NHS bosses said patients would be assessed on the emergency floor by a range of physicians and surgeons who could quickly diagnose what treatment they needed. They said the current A&E at Brighton remained the same, but with ongoing improvements. Both A&E and the emergency floor are separate to the hospital's urgent care centre, which is for people who have minor injuries. Ms Griffiths said the £30m funding was subject to an approved final business case, but it was hoped that would be done by the end of June.